Marlena Wordlaw said her 6-year-old daughter Madisyn Moore was pulled out of class at Fernwood Elementary for taking candy off of a teacher’s desk. A woman is outraged after she says her daughter was handcuffed while at school. Marlena Wordlaw said her 6-year-old daughter Madisyn Moore was pulled out of class at Fernwood Elementary for taking candy off of a teacher’s desk. Wordlaw said her daughter was then handcuffed under some stairs at school to teach her a lesson. Madisyn explained how the school security guard handcuffed her after lunch. 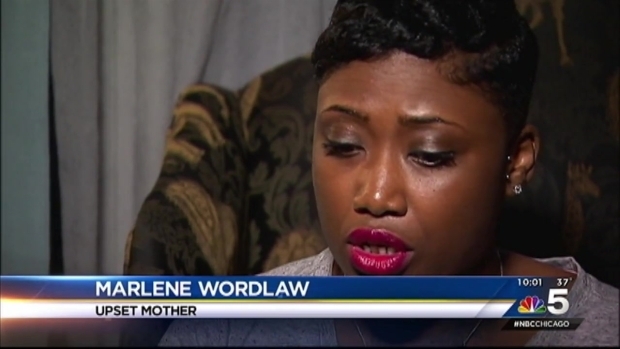 A woman is outraged after she says her daughter was handcuffed while at school. NBC 5's Natalie Martinez reports. Wordlaw showed up to Fenwood elementary 50 minutes after getting the call that Madisyn had gotten in trouble for taking candy. “I said ‘why you have my baby in cuffs?’ He said, 'because I'm trying to teach them to stop taking stuff that don't belong to them'." To make matters worse, Madisyn was apparently detained under some stairs. “I understand these teenage boys and whatever the case may be, yeah you can try to teach them a lesson but this is a little girl," Wordlaw said. Wordlaw says she approached the principal, who tried to apologize for the incident, but she wasn’t satisfied. "I don't accept your apology ever," Wordlaw said. Marlena worries about what could have happened. “I’m more angry than anything, because it’s my only daughter. I feel like anything could have happened to her. Somebody could have touched her. She's in the dark under the stairs," Marlena said. CPS has yet to respond to requests for comment. Marlena said she is planning to sue.